March 10, 2016 –Pensacola, Fla. – To commemorate the 10th anniversary of the reefing of the USS Oriskany in May, Visit Pensacola invites explorers of all ages to visit this historic seaport, located on the northwest edge of Florida, and explore some of Pensacola’s most incredible scenery hidden beneath the waves. On May 17, 2006, the Oriskany became the first U.S. warship scuttled under a Navy pilot program to convert decommissioned naval ships as artificial reefs. Explosive charges were detonated along the retired 911-foot naval aircraft carrier, and at 44,000 tons, the Mighty O sank stern-first in just 37 minutes to become, by far, the largest vessel ever sunk to make a reef. The massive warship now rests upright on the sandy bottom, 212 feet below the surface of the Gulf of Mexico about 24 miles southeast of Pensacola Pass. The Mighty O has also become a big lure for history and military buffs, including veterans who once served on the ship. Commissioned shortly after World War II, the ship served primarily in the Pacific, earning two battle stars for service in the Korean War and ten battle stars for service in the Vietnam War. Although the Mighty O may be out of commission above the water, that is certainly not the case below. The ship is visible to divers at every skill level, however accessing the ship’s flight deck region requires an advanced diving certification since it is located at 145 feet — about 15 feet outside the recreational diving limit. Her crown, or island, can be approached at 78 feet in emerald-clear water where visibility averages 70 to 150-plus feet. Three Coal Barges – The wreckage of these barges creates a bridge of undersea habitat and is a great location for beginning divers to practice. San Pablo – A freighter ship sunk in 1944, her wreckage is scattered across the seafloor where divers can explore huge sections of twisted metal – home to an impressive array of marine life. Pete Tide II – Reefed in 1993 about 12 miles south of Pensacola Pass, the Pete Tide II is intact and upright and easy to penetrate. Sea turtles, triggerfish and schools of red snapper and amberjack can often be found there. YDT-14 – One of two Navy diving tenders sunk in 2000, the ship is home to resident barracudas. 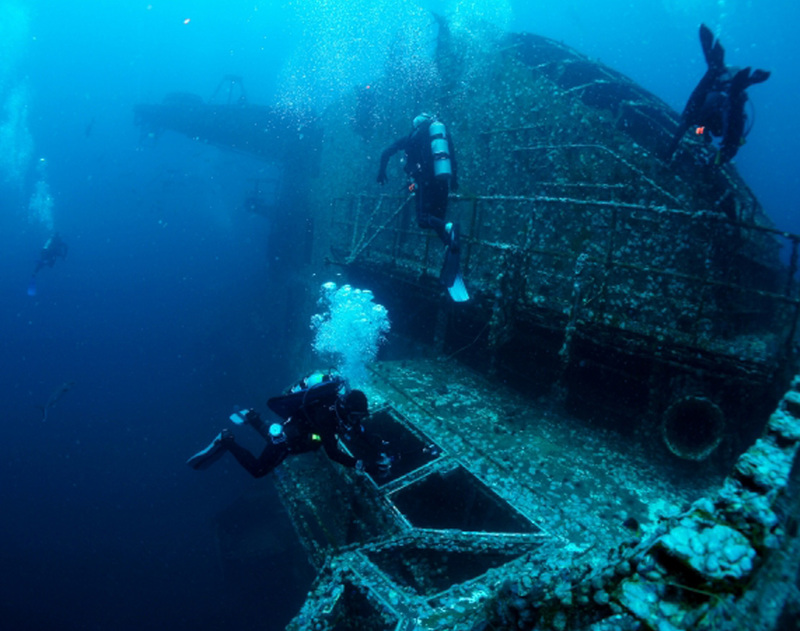 In addition to the Panhandle Shipwreck Trail, several other local dive sites are accessible to divers of various skill levels including the USS Massachusetts, commissioned in 1896 — one of the nation’s oldest battleships, located just 25 feet down about 1.5 miles from the Pensacola shore — and the 400-foot freighter Antares in Pensacola Pass, a favorite spearfishing destination. Don’t have a scuba diving certification? Don’t worry. For those who prefer snorkeling in shallow waters, there is an extensive artificial reef system along Pensacola Beach and Perdido Key. Park East is located about 1.4 miles east of Portofino Island Resort on Pensacola Beach. The reef on Perdido Key can be accessed from the public beach area off Sandy Key Drive. The reefs are located 500 feet off shore where snorkelers will find a variety of fish, sea turtles and sea life in the clear waters of the Gulf.